Do you have any idea what it’s like to drive for nearly 50 minutes with a fresh from the oven pizza in your backseat? Well let me tell you it’s NOT easy. Once the smell of warm pizza makes it to the front seat you’ll find yourself torn between driving as fast as you can (doing the speed limit of course) and just pulling over to sneak a slice on the side of the road. I found myself in such a predicament last night, when I decided to stop for an Aiello’s “back door pizza”(more on this later), on my way home from work. Oh and yes it takes me 50 minutes, on a good day, to get home from work but that’s a whole other issue. Joe and Myrah Aiello just recently started selling pizza literally out the “back door” of their central Phoenix restaurant; Aiello’s. What a great concept. Call in advance; swing around back; grab your pie and head on home. Can’t get much easier than that and the pizza is delicious. They’re currently only making 50 pies per night; so when they run out they run out. Thinking about it now I probably should’ve keep this to myself. But what kind of "Food Hunter" would I be if I did that. I have a theory about pizza; If you can eat it plain, without any toppings, and enjoy it, than you know it's a good pizza. Think about it; it’s not that hard to mask a so-so pizza behind tons of toppings. It’s a plain that lets the important ingredients really shine. So of course plain is what I got last night and I must say it was great. Hailing from NYC Joe really knows his pizza…not that I’d expect anything less after having eaten at his restaurant. It’s NYC style; which I love. The crust was perfect; not thick like Chicago or thin like some gourmet brick oven pizza. It’s what I refer to, for lack of a better description, as real pizza. Although $16 might initially sound a little steep. You get what you pay for and not only was the pizza delicious it was huge. It was 18 inches and barely fit in the box. So was it worth driving with it for 50 minutes in the back seat…Definitely. Although, next time you might just see me on the side of the road eating a slice. If you do...please just keep driving. I don’t share well! Oh, goodness, I'd have to pull over and stuff a piece in my mouth! I'm a piglet like that. This looks so good! 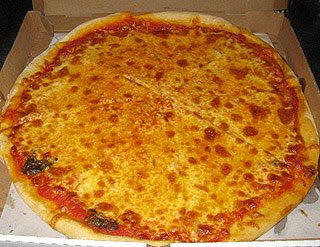 That does look like a good NYC pizza...my favorite! 16 dollars sounds about right for NYC pizza lol! This looks delicious. That looks delish...seems like I can almost smell it now! LOL at you eating pizza on the side of the road. I probably would have been right there with you if I had that in my backseat. I don't know if I ever officially gave you the link but I moved my blog a few weeks ago, I'm at http://ingoodtasteblog.net now. I wish I lived in Phoenix and could try this pizza! It's getting late now, getting hungry. I wouldn't a mind a piece of pizza. 16 bucks isn't that bad. 50 minutes!!! Gosh, I would NOT resist pizza smell!! I don't think that I could have made it home without having some. Wow that looks great...I love pizza YEAAAAAAAAAAAAA!!!!!!!!! !